Great Deal Villa with € 200.000,-Redused now only € 595.000,- 6 Bed and 5 Bedrooms Plot 1,591m2. Total built size 487,72m2. Living area 336,97m2 plus 43,47m2 garage. Porches and terraces 67,68. Storage room and warehouse 39,60m2. Pool 80m2 Malaga in Spain. Highly recommended to visit the property as soon as possible to appreciate its great potential! 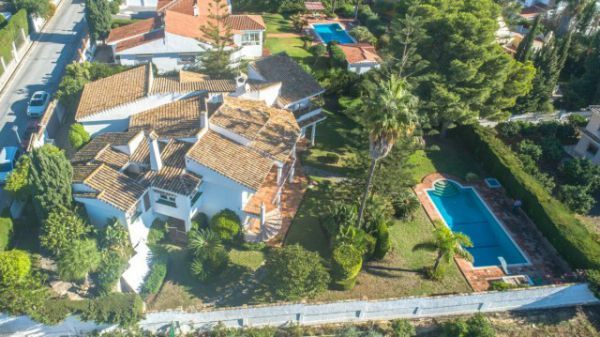 Large Villa very well built and distributed with the need to modernize it located in the exclusive urbanization El Olivar close to the airport, schools, services and beach. Access floor: Large entrance hall with wardrobes, living room with fireplace and access to the large porch, bright independent dining room next to the large kitchen with pantry and dining area. Very large master bedroom with terrace, dressing area and bathroom end suite. Second bedroom and a bathroom. Bedroom and bathroom for the service located behind the kitchen with patio and separate laundry room. Garage for 2 vehicles with automatic gate. Ground floor with garden level: Large multipurpose room ideal for entertainment with access to the barbecue area. 3 double bedrooms and 2 bathrooms (1 en suite). Covered porch overlooking the garden and pool. Outside: Beautiful garden ideal for children and pets with irrigation system, fruit trees, and a large pool surrounded by sunny terraces and with lots of privacy. BBQ area. Spacious room or bedroom for use by the gardener with bathroom. Plot 1,591m2. Total built size 487,72m2. Living area 336,97m2 plus 43,47m2 garage. Porches and terraces 67,68. Storage room and warehouse 39,60m2. Pool 80m2. Community 463,46€ per quarter.IBI 1.036,5€ per year. Los Rosales School 450 meters. Plaza Mayor Shopping Center 3.5km. Recent reduction from 795.000€ to 595.000€! !